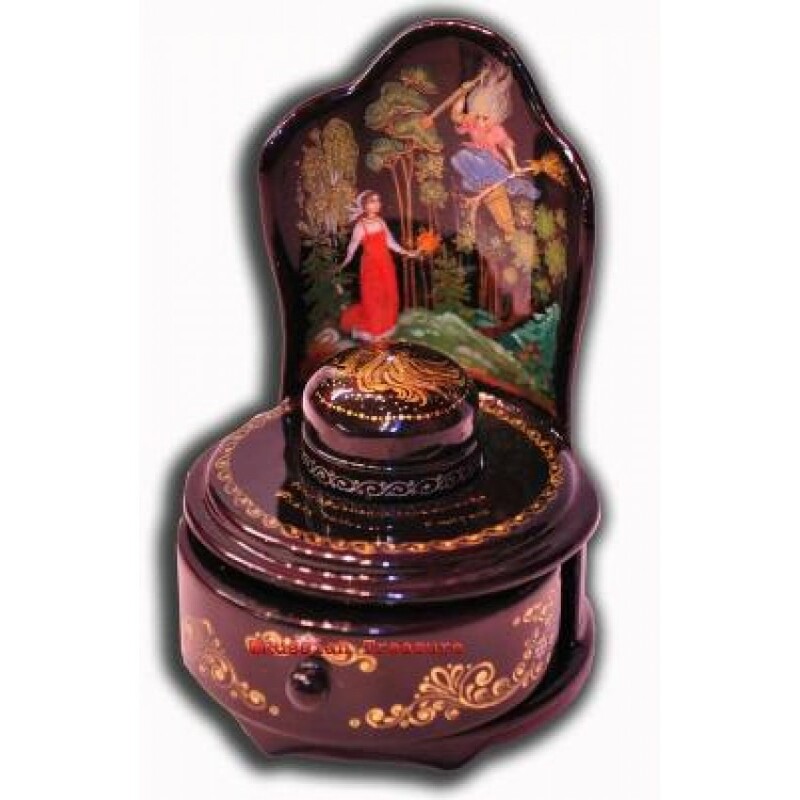 From the very first sight at this Palekh Russian box “Vasilissa the Beautiful” you will be stricken with its exceptional detailzation and sensational relevance to the worlds-famous Russian fairy-tale about Vasilissa the Beautiful. The form of this Russian box is rather unique for Palekh boxes, it consists of a box itself skillfully ornamented with gold paint, its glorious lid with cockerel print on the knob, and the back richly painted with the scenes of the tale. You can see on the Russian box Vasilissa the Beautiful wandering through the dense woods, searching for a light for her stepmother and stepsisters. But, unfortunately, the girl meets the witch Baba Yaga, who frightens her. The Russian box’s master - Smirnov has virtuosic featured the moment of this scene: he has transferred both fear of a young beautiful girl and grumpiness mixed with bloodliness of the old ugly witch. This moment is placed on the front side of the Russian box. On the flip side the artist has caught the most magical moment of the story – the scene behind the Baba Yaga’s hut on chicken's feet, where Vasilissa the Beautiful sees the horseman of sun flying around. The colors of the horseman and Vasilissa the Beautiful are very bright and vivid, they contrast magically against deep mystique background of Russian box. The details of both heroes are fine and each face has a distinctive look to it. Both scenes are well painted in bold, crisp colors, with fine golden accents. Traditionally to Palekh miniatures, the Russian box is hand-crafted of high quality papier mache and is signed on the lid with the artist's name (Smirnov), village of Palekh, the name of the work (“Vasilissa the Beautiful”), and date of completion (2001). The exterior of the Russian box is covered with black lacquer, and the interior - with red one. This Russian box was done back in the year 2001 and is as elegant now as ever, and only the Buyers of Russian Treasure shop have an exceptional possibility to own this time-tested treasure. If you want to astonish the person you love and appreciate with a really fairy-like present - than don’ waste the moment to buy the Russian box “Vasilissa the Beautiful”.